When you live with a family of geniuses, a normal day involves ancient robots, flying baby carriages, and mysterious millionaires. All before lunchtime. Meet Nick Newton, a merely average boy from the country of Thauma. 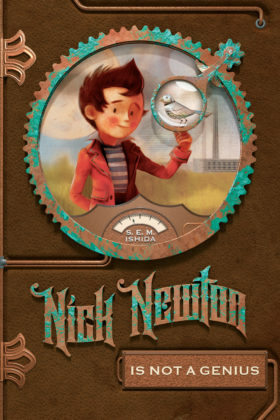 Nick’s not brilliant like his mom and dad or a child prodigy like his sister, but he won’t let that stop him from uncovering the mysteries of a clockwork factory or revealing a war hero’s greatest secret. With help from two new friends and his butler named Jude, Nick embarks on an adventure that will change his life forever. Book 1 of the Nick Newton series.